The Maiden of Lust (previously known as the Mistress of Pain) is a Diablo III Boss. She is a Demon type monster who resides in the Heart of Sin in Act III. The Mistress of Pain is a likely candidate to be a Boss type monster. Apart from having a title, a conceptual artwork depicting the Mistress of Pain lists several of her abilities - more than typical monsters have. The Maiden of Lust is a demon with an upper body of a woman from the waist up and a body of a spider. She walks on six spider-like legs that appear to be made of soft flesh instead of the hard carapace found in spiders. The spider portion of her body also has a pair of bladed mandibles which are used for slashing attacks. Her upper body appears to be that of a beautiful human female but has claws on her hands and many sharp teeth. Her spider abdomen has large spinnerets that produce sticky silk which impedes player movement, as well as explosive projectiles that disperse in a cluster around the player. Another artwork depicts her hanging by chains attached to her greaves, wearing dress-like attire and a serene expression. The significance of this has not been made clear. Much like Azmodan, Cydaea will taunt the player as they decent the Tower of the Damned with her silky voice, descending from the ceiling into the player's view from a web. She is the "mother" of the succubus monster type and shows great affinity towards them. Pain Bolts - The maiden will fire a handful of green projectiles imbued with poison damage at the hero for moderate damage. Web Trap - Cydaea fires a projectile on the ground which produces a long-lasting web trap, which slows the movement speed of anyone caught in it by roughly eighty percent. Spider Pits - Cydaea will fire a green projectile on the ground which erupts into a pool of green acid. Small spiders, low in damage and health but high in number, will continuously spawn from the pit. She often casts this before fleeing from the player. Inferno Difficulty - As of Patch 1.0.3, Cydaea will hit her enrage timer after four minutes, spawning spiderlings more frequently. In addition, the spiderlings have more health, hit harder, and are also more spread out in inferno. Cydaea is in some way involved in the following achievement(s). Besides the fact that she originally was portrayed to live in something that looks like a sewer, hanging from chains with skulls dangling around her, in her pretty dress, nothing is really known about the Maiden of Lust. Seeing as she has a nice dress, it might be some corrupted human princess in ages back, who's still very aware of fashion, but no one can do anything besides speculate. Though Azmodan is close to all of his lieutenants, Cydaea is his special favorite. The Maiden of Lust is both beautiful and grotesque in appearance, with the torso of a woman and the legs of a spider. Her voice is said to be as smooth as honey, but she only speaks words of death. 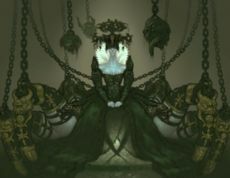 The Mistress was originally only shown with the chains, and called the "Spider Queen" by the Diablo 3 community, but a few crumbles of information became available when the denoted concept art was released. The first work must have been on July 2003 or earlier, since concept art by Peter Lee is dated to this time. 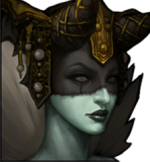 The Mistress of Pain was originally removed from the game over time constraints, but after a fan created a cosplay costume of her for BlizzCon, the development team decided she needed to be put back in. They then changed her name to the Maiden of Lust, and chose her as a lieutenant for Azmodan's army. Notated concept art by Peter Lee. The Mistress alone in some sort of cellar. Mistress of Pain 3D model by Delowyn. The "Durance of Pain" by Delowyn. Mistress of Pain Cosplay by Rainyia. Render of the Maiden's model. This page was last edited on 30 September 2013, at 20:39.